I have recently returned from Hong Kong where I spent 3 weeks involved in a range of academic programs. The first was the ICT2007 conference where I spent a couple of days with some really creative IT educators from school and university sectors. I presented a couple of papers and attended several others. 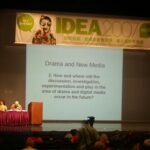 The second event was the IDEA2007 World Congress for Drama Education. This was a great event that gave me a chance to catch up with colleagues from around the world. I was running a Special Interest Group on Drama and New Media with Klaus Thestrup from Denmark. We were given access to the Hong Kong Arts School computer labs which really added a different dimension to theSIG. This year we had only 6 hours of contact time in the SIG and we were strapped to cover all the issues at hand. The SIG drew interest from total newbies in the world of Drama and Technology right through to seasoned campaigners who have tried all manner of project. This presented some interesting tensions as some people were seeking something akin to a workshop that would help them upskill, while others sought to see the SIG drive policy and projects. I also offered a workshop entitled DramatARGy that considered the possibilities of extending Process Drama into an Alternate Reality Game. I enjoyed the group who attended and was intrigued that one young American student who stayed in the lab simply to use the facilities found himself drawn into what I was suggesting and he ended up urging the other teachers assembled to consider the approach as a genuine and engaging alternative. One of the most revealing events was the “Trialogic Keynote” that saw the presidents of the 3 arts education world bodies presenting on their organisations. Interestingly, Drama being the youngest (most recently formed) organsiation also came across as the most staid and conservative. One might be forgiven for believing that IDEA is simply a Young People’s Thetare body with a focus on community cultural development – schools, technology and industry were all absent in the profile presented for Drama Education. As you might recall, during the conference I spoke about how the Office of the UNESCO Regional Advisor for Culture in Asia and the Pacific is working towards initiating Arts Education Observatories – clearinghouses which will compile, analyze and disseminate evidence of the effects of Arts Education, so as to support advocacy processes. It is hoped that we can establish at least eight Observatories within the Asia-Pacific region by early 2008. The research-results from the Observatories across the region will be compiled and presented at the second World Conference on Arts Education, to be held in Seoul, Republic of Korea, in 2010. I’m not clear on the politics of everything that transpired, and am pretty sure that some of my comments during the event will ensure I’m not on the list of invitees for the next one. I was especially annoyed at some of the discussions about youth culture that excluded youth and diminished the importance ofthe cultural practices of young people. There was a distinct Modernist elite mindset that became evident in many sessions. When I get my head around it all a bit more I mightwrite some more.